Last night, let there be no question, was a devastating night for the New York Knicks. They missed a golden opportunity to take a 1–0 series lead over the defending Eastern Conference champions, they may have lost their point guard for the season, and the superstar for whom they traded half their roster had a miserable night and didn't even seem to notice. But still: The Knicks darned-near sneaked out a Game 1 win on the road against the Boston Celtics. They must have done something right. The Knicks lost by only one two in a game in which Carmelo Anthony and Chauncey Billups, ostensibly two of their best three players, were terrible. Thus, plenty must have worked to make it that close. Thus, here are seven positive takeaways for the Knicks, seven things that it would behoove them to have go right again on Tuesday. 1. 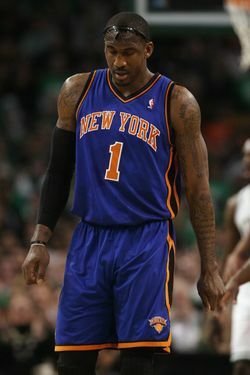 Amar'e. It's difficult to overstate how fantastic Amar'e Stoudemire was last night, particularly in the fourth quarter. If you needed a primer on what exactly winning in the playoffs requires, Amar'e provided it: BEAST MODE, as they say. (They say this.) Sadly, we can't say that Amar'e's fourth-quarter dominance will teach Mike D'Antoni and the Knicks to stop ignoring him down the stretch, because they always ignore Amar'e down the stretch. Even when he's as amazing as he was last night. 2. Landry Fields' first-half defense. Fields had a miserable offensive night, but in the first half, he was terrific on Ray Allen, chasing him around everywhere and not letting him get loose. He has a few inches of height on Toney Douglas, who was guarding Allen in the fourth quarter, so maybe we'll see more of that in the upcoming games. (Though Kevin Garnett would have tripped Fields too.) It would help if Fields could remember how to score. 3. Ronny Turiaf. When Turiaf is healthy and able enough to give the Knicks 30 minutes, like he did last night, they're a dramatically different team. Turiaf's defense was consistent and pestering, and his offense was a pleasant surprise, scoring nine points on 4-of-5 shooting. It seems like we saw him coming off the pick-and-roll even more than we saw Amar'e coming off it (Amar'e was doing all his work in isolation, because, you know, BEAST MODE). It'd be nice if he could rebound a little more, but with Shaquille O'Neal hurt, Kendrick Perkins gone, and Jermaine O'Neal highly unlikely to play two great games in a row, Turiaf's going to have lots of room to maneuver. 4. Bill Walker's surprise early cameo. Your leading Knicks scorer at the end of the first quarter of their first playoff game in four seven years: Bill Walker! Pretty good for a guy who was barely cracking the rotation in March. With Carmelo's early foul trouble — oh, Carmelo, don't pull that again, okay? — Walker stepped up and scored seven points in the first quarter, including a couple of pretty drives to the basket. He played ten and a half minutes in the first and just six and a half the rest of the way, scoring no more points, but when the Knicks' offense is stagnating, like it was in the third quarter, he's a nice injection of scoring to have coming in off the bench. 5. Rajon Rondo still can't shoot. He was 5-for-14 from the field even though the Knicks left him wide open every time he came down the court. He also had only nine assists, far below his average against the Knicks. One of the main reasons the Knicks stayed so close was their handling of Rondo. If they can keep that up — and it could arguably become easier with Billups out; the Jared Jeffries Guards a Point Guard technique was sorta intriguing — they'll remain in this series. The Knicks' strategy for the first three and a half quarters was to not let Rondo beat them, and he didn't. 7. Everyone on the team is now a playoff veteran. When you really break it down ... the Knicks lost last night's game because the Celtics have played dozens of playoff games together, and the Knicks haven't. The Celtics knew what to do down the stretch because they've done it so many times. So, uh, now the Knicks have one more game of playoff experience than they did 24 hours ago. Hey, it's something. Maybe they'll learn to step over Garnett's outstretched foot now, for one thing.